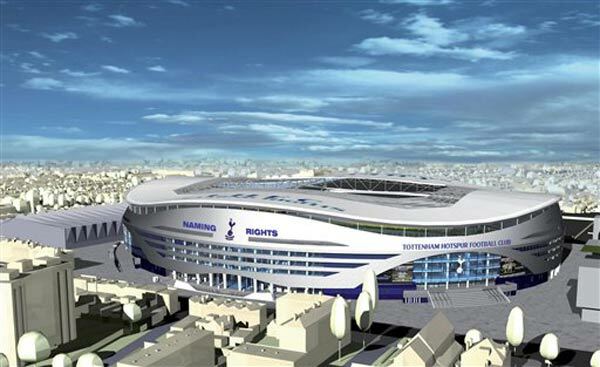 Tottenham have released the first images of their new stadium project. Check out the name gloriously displayed across its side. 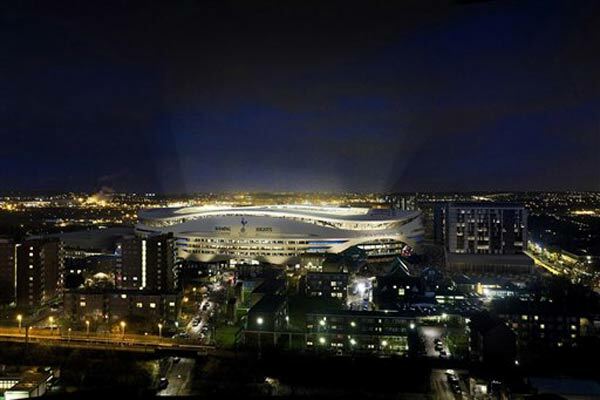 Seriously, if you were a Spurs employee, and you saw that your bosses were about to release images of a beautiful new stadium with “NAMING RIGHTS” emblazoned across the side of it, do you think you might have cautiously raised your hand and suggested putting something else there? Something a little less, I don’t know, nakedly mercantile? Obviously I realize that the club will in fact sell the naming rights, so I guess this could be taken as a welcome dose of honesty. But given that their accompanying publicity material is all about putting supporters first and creating the ultimate fan experience, the name on the image strikes a dissonant chord at the very least. What do you think of the stadium itself? Is it too cautious for its own good? I like the curviness, but there’s a cheap-toy quality in the way it’s put together that may be a product of its being a computer graphic that does not yet exist in the real world, or may not. Actually, if you look at the pillars along the side as teeth and the lines under NAMING RIGHTS as eyes, it suddenly takes on much more personality. I think it looks a bit like a stepped-on beer can. It’s a cliche I know but, you just couldn’t make it up. I’m not exactly blaming him, but I’m not not blaming him, if you know what I mean. “Tottenham Hotspur Football Club”, what the hell sort of name is that for a stadium? Whatever happened to just calling the ground “the Pound Buster Arena” or the “Woolworths Stadium” like the good old days? Honestly, clubs today, they don’t know how lucky they are. Well, it was their second choice, you know. Apparently “Arsenal Football Club” was taken. not half as good as the Emirates Stadium to be honest… COMON U GUNNERS! !